As of late I have been what you might call obsessed with embroidery. I have never been a needleworks kind of gal, but when you have a new baby you craft what you can. No one tells you that when you have a baby you will spend majority of your day sitting on a couch with a Boppy across you and a baby using you as a snack bar and a pillow. That being the case small handheld craft projects are a necessity for idle hands. I have searched the web high and low and managed to find quite a few super cute free embroidery patterns. Now given there is some tracing and carbon paper involved in this method, but it takes 2 minutes longer than the iron on variety. Today I thought I would do a little roundup for the other couch bound crafters out there looking for something to do. 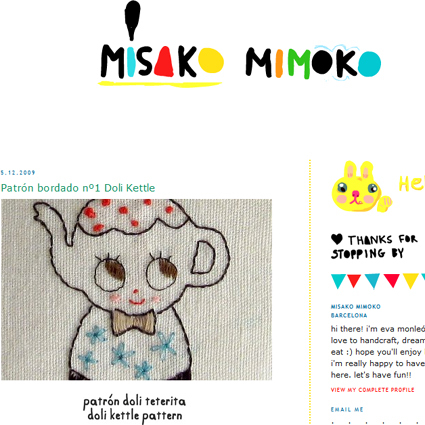 Misako Mimoko has the most adorable tea kettle pattern on her site that I have ever seen! Well it’s the only one I have seen, but it is really cute either way. Complete with a stitching suggestion guide. This is the pattern I am currently working on and it is turning out darn cute with my appliquéd embellishments if I do say so myself. 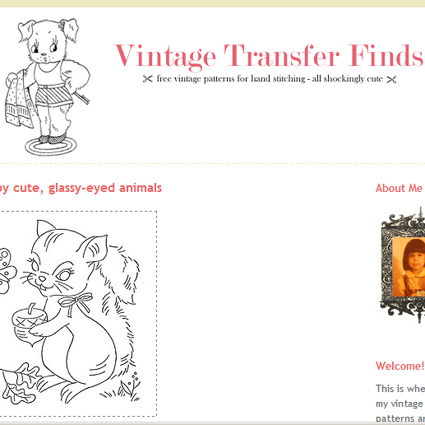 The Vintage Transfer Finds blog is exactly what the name implies and that is why I love it. 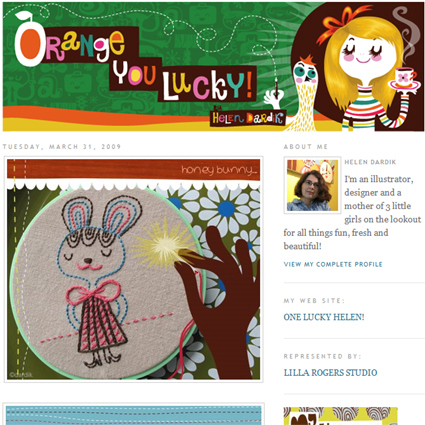 The cute explosion on the Orange You Lucky blog carries over into the embroidery world with this adorable bunny rabbit pattern. No need to wait until Easter to stitch up this perky eared cutie. The minute I finish the tea kettle she is next on the agenda. 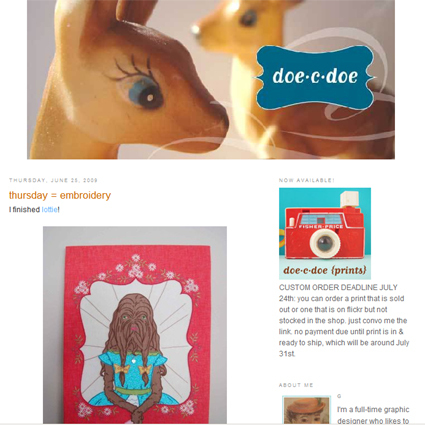 Every Thursday on the Doe-c-Doe Blog is embroidery day where the free patterns are a plenty. The pattern of the hairy dog faced girl is not free, but it is amazing and I plan on purchasing the pattern from Bad Bird pronto. My fellow Austin Craft Mafia member Jenny Hart of Sublime Stitching has a super fine selection of free embroidery patterns you can spot on her blog and on her Flickr page. I adore this little lady and plan on embroidering her on a shirt for Tallulah at some point. Sometimes the best things in life are free, you just have to spend a little bit of time looking for them! Posted July 7, 2009 & filed under Easter, Needle Arts. awesome! Now i want to dig up my hoop and embroidery needle! I love the kitty and grrrl. So cute! i have also been bitten by the bug! 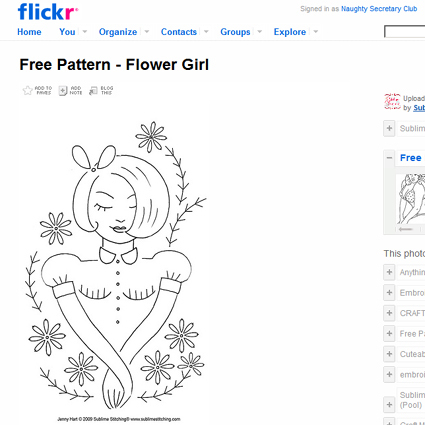 I don't know why i didnt think of searching for free patterns….duh! Thanks for the links! Great idea! I will have idle hands when my baby comes out in a few days…but hmmm should probably finish the blanket I started for him. happy to know you liked it!! I've just seen the adaptation of the pattern you've made and the appliquéd embellishments really work!! Very informative information is this…..i like it….Great links you share with us..really its helpful as i can see…..
Moms would sure ly enjoy this new trend. This would help thenm be more creative and artistic in their home decors. The embroidered animals are so cute! these are absolutely precious!